Prompted by the welcome problem of a growing congregation, Winners Chapel in Lanham, Maryland recently moved to a new location where it could build a 1,500-seat sanctuary. It is an older industrial park building, with characteristically low ceilings punctuated by numerous support columns. 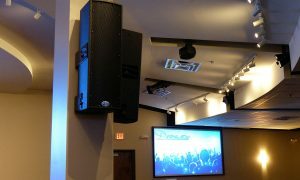 When its initial DIY sound reinforcement system failed to deliver the kind of spirited, impactful audio that the church had hoped for, it called on Virginia-based A/V integration firm RTW Media. Playing to the challenges of the unique space, RTW Media engineered a solution based on Danley Sound Labs SBH-20 column form-factor loudspeakers, which deliver point-source fidelity, excellent pattern control, and a clean aesthetic. Danley TH-118 subwoofers contribute low-end. Because the good people of Winners Chapel worship with very high energy, they requested an additional Danley TH-118 subwoofer, bringing the total count to two. “The low end in the room sounds great, especially since they don’t have to drive the system too much to get plenty of output,” Guida said. In addition, a DiGiCo S21 console serves as the church’s mixing interface and connects to the stage with a DiGiCo D-Rack. Aviom personal monitor mixing supports the stage musicians, and AMX controllers give church staff control over audio, lights, and video.